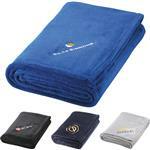 The Custom Microfleece Throw Blanket with your logo embroidered by Adco Marketing. 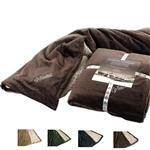 100% polyester, reversible self-hemmed throw, super plush blanket with soft faux lambs wool, hidden zipper for ease of decoration, free decorative rope for packaging. Gift box and other packaging optional. Production Times Available: Standard 7-Day Production with Paper Proof. Typical Imprint Area(s): Varies on Stitch Count. 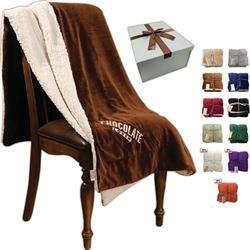 100% polyester, reversible self-hemmed throw, super plush blanket with soft faux lambs wool, hidden zipper for ease of decoration, free decorative rope for packaging. Optional packaging options like box, hang tags, etc. are available.